JPP Järvelän pikkupelimannit (Little Folk Musicians of Järvelä) formed in 1982 in the fiddling capital of Finland (and perhaps the world), Kaustinen. Born from the fiddling tradition of the Järvelä family, in Järvelä village in Kaustinen, JPPs musical roots go back to the 19th century. 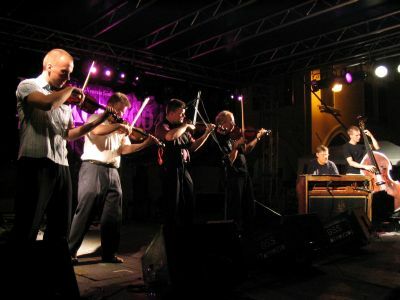 Their initial spark came from the local and national folk music boom in the 80s, particularly the phenomenal national success of Kaustinen fiddler/composer Konsta Jylhä, and their distinctive skills at composing and arranging immediately emerged, forming the basis for their style, appeal and future career. JPP members have experience and training in musical genres outside folk music, for example classical and jazz, therefore expanding the scope of their music far wider than ordinary fiddle groups. In effect, JPP have created a style all their own, one that is impossible to categorize easily and one which continuously surprises. JPP has toured and performed on every continent and has a collection of nine albums to their credit. Their latest studio album Artology exhibits the brilliant composing and arranging skills of chief writer Arto Järvelä while simultaneously sending the listener on an exciting melodic journey through the heart of Ostrobothnian fiddle country and JPP's own imagination, featuring plenty of unexpected twists and turns.